To follow clinical measures in Type-1 diabetes (T1D) adults starting insulin pump (CSII) therapy. A retrospective review of clinical and biochemical data of T1D adults commencing CSII therapy in three diabetes clinics at St Vincent’s Hospital Melbourne and Werribee Mercy Hospital. Data collected from clinic records, public hospital and private pathology services, included: age, T1D duration, blood pressure (BP), BMI, HbA1c, lipids, and urinary albumin to creatinine ratio (ACR). Results are mean±SD. Data were available from before to up to eight years after CSII initiation for 88 (34% males) of 103 subjects who commenced CSII in or after 2003. Age and diabetes duration at CSII-initiation was 37.5±11.5 and 16.0±9.3 years respectively. Eleven % of subjects were <25 years old, 39% were 25-35 years, 25% were 35-45 and 25% were >45 years. BMI was 28.2±4.6kg/m2. BP 123±12/75±5mmHg. Follow-up was 3.9±2.4 (range 0.33–8) years. Pre CSII HbA1c (Fig. 1) was 7.8%, with 19% of subjects with HbA1c<7% at baseline and 38% at year 1 post-CSII. Baseline lipids (mmol/L) were: total cholesterol 4.6±0.9, HDL-C 1.6±0.4, LDL-C 2.5±0.8 and (median(Q1-Q3)) triglycerides 1.0(0.6-1.4). Baseline urine ACR (median(Q1-Q3)) was 0.1(0.1-0.5) mg/mmol. Annual mean±SEM HbA1c are shown in the Figure, with the inset showing HbA1c in the first 2 years. 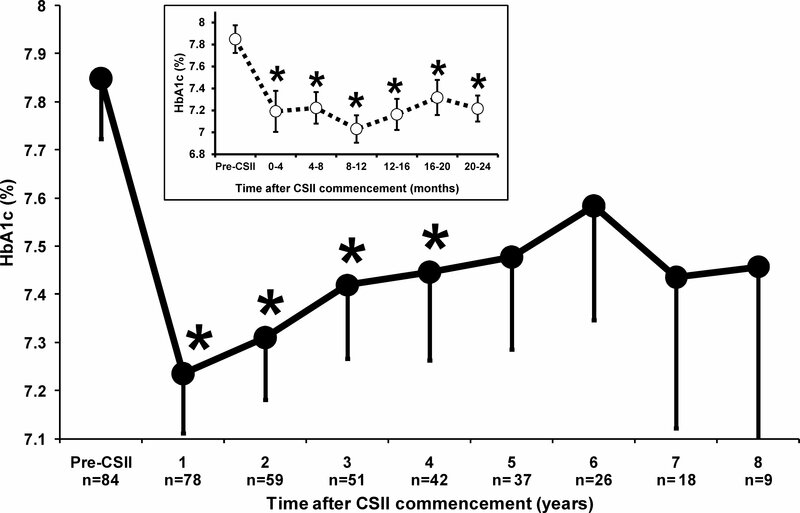 HbA1c levels up to year 4 post-CSII commencement were lower than pre-CSII levels (p<0.01). Mean weight, lipids, BP and urine ACR, did not change significantly. In T1D adults commencing CSII in our clinics, mean HbA1c fell from 7.8% to 7.2% at one year, and remained significantly lower for up to 4 years. In the few patients with longer follow-up, HbA1c returned towards baseline. Internationally, mean HbA1c reduction in CSII-using T1D adults is 0.3% , substantially less than locally. Weight, BP, lipids and ACR did not change after CSII initiation.